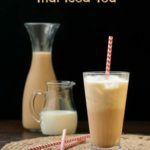 A recipe for Thai Iced Tea, a deliciously sweet and creamy drink made with brewed Thai or black tea. It is a popular beverage served in Thai restaurants. Bring 4 cups water to a boil. Add the sugar and stir until dissolved. Remove from heat. Steep the tea bags and star anise in the hot water for five minutes. Strain the tea bags and star anise from the liquid. Add the condensed milk and stir to combine. Allow to cool to room temperature. Fill four 8 ounce glasses with ice. Pour tea mixture into glasses leaving enough room for evaporated milk. Top each glass with 2 tablespoons each of evaporated milk. Total time does not include time for cooling tea to room temperature. Recipe © copyright 2013 Katie Chin from Everyday Thai Cooking. Used with permission by Tuttle Publishing.